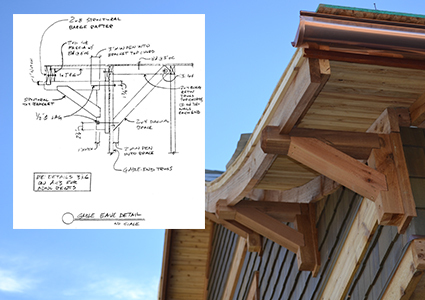 An example of the design behind a gable eave on a home, with the finished result. King Engineering has a diverse array of capabilities, but we are first and foremost a consulting structural engineering firm with licensure in Colorado, Wyoming, New Mexico, Utah, Nevada, and Arizona. Principal engineer and owner, Adam King, first gained experience working on a wide range of projects from stadiums and multi-story commercial buildings to small residential designs and inspections. Upon gaining professional engineering licensure, Adam saw a dire need for structural engineering services on smaller projects as well as improved coordination between structural and architectural elements for custom and production homes; all while accommodating the fast-paced expectations of today's construction industry. Hence, King Engineering was formed to meet that demand. Early on, Adam also realized a lack of sustainable-minded engineers who understood the need to sharpen their pencils in order to achieve cost-effective and creative solutions to design the structure around sustainable and energy conscience building principles. For almost a decade now, King Engineering has met that demand with a proven track record in all facets of structural engineering with acknowledgement of architectural and building science requirements. Although adept at designing with all common building materials, we have gained extensive experience in the design of wood structures, whether it's conventional light-frame or heavy timber construction. We promote the use of wood as the most sustainable of all common building materials. Wood is renewable when farmed or forested responsibly, is produced with the sun's energy and the earth's natural ingredients with little or no human input, and acts as a natural carbon sink to reduce atmospheric carbon dioxide. And the icing on the cake is that it's usually the most cost-effective option! At King Engineering, we believe the highest performing, lowest operational cost, and most environmentally conscience building consists of a super-insulated, air-tight structural shell built of ICF, SIP, and/or advanced framing techniques along with sustainably harvested and recycled engineered wood products incorporated throughout the structure where possible.